Take for example the above pair of 1969 Democratic Republic of Congo (aka Congo Kinshasa) definitives with portrait of President Mobutu Sese Seko. Like most of the portrait stamps these are seemingly unattractive to work with. What makes these stamps interesting for technical oriented collector are the contradicting catalog details. Scott states all the stamps are perforated 13, Belgian specialized catalog COB goes with figure 13½, Yvert mentions they are all perf 14; and last but not least Michel (correctly) mentions values from 1k to 10k come in both perforation 13 and 14, and higher values are perf 13 only. Why oh why stamp catalogs consistently fail to get elementary details such as perforations lined up in consistent manner is beyond my understanding, but it definitely provides a target that needs public poking every now and then. That alone would make a pretty short and dull story to write/read, and as such I was thrilled when I noticed the fact that all perf 13 stamps do have somewhat asymmetric perforations holes. Alas, I failed to locate any specialized articles discussing these stamps. So all I can say is wild assumption that perf. 14 stamps were perforated by De La Rue, whereas perf 13 was likely done locally (to save money etc) at inferior quality. Another highly popular approach used by many leading stamp magazines is to look stamps as pieces geopolitical history. One could spend a lifetime uncovering the tale of two Congos: how the French Congo became Congo Brazzaville, and how Belgian Congo became Congo Kinshasa; and how Congo Kinshasa fell to pieces when colonial powers tried to exit too quickly, leading not just to birth of short lived states of Katanga and South Kasai, but also one of the most bloody civil wars ever. 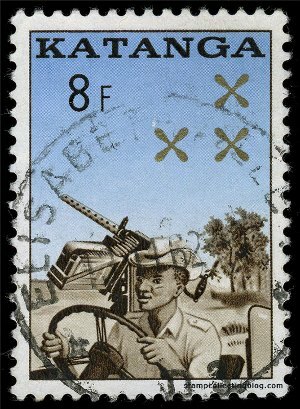 And how upon the death of UN Secratary-General Dag Hammerskjöld near Congo, the world simply allowed General Mobuto to crush all secessionist movements and unify Congo Kinshasa. You cannot change what stamps are, but you can always change the way you look at them. Just be warned that it may increase your knowledge on the world around us.